Safety Leader. Taurus provides families outstanding protection in being rated the safest large car in America. More of Everything. New Ford Taurus features more than 500 engineering changes, making it more distinctive, quieter, faster and safer. Powerful. 3.5-liter Duratec V-6 delivers 263 horsepower – an increase of nearly 30 percent from the previous engine. Confident. Available electronic stability control and all-wheel drive provide confident ride and handling in all weather conditions. Connected. Ford Sync™ offers new levels of connection, control, simplicity and personalization for electronic devices such as cell phones and media players. The 2008 Ford Taurus features more than 500 improvements that make it more distinctive, quieter, faster and safer. Highlights include new exterior styling, a new powertrain, a new all-wheel-drive system, more standard safety features and structural upgrades to further enhance crash protection. “Customers will find the 2008 Taurus delivers more of what they are looking for, including a strong design, high-quality interior, power and performance, must-have features like Ford Sync and a great safety reputation,” said Cisco Codina, Ford’s group vice president, North America Marketing, Sales and Service. The 2008 Taurus features Ford’s 3.5-liter Duratec V-6 that delivers 263 horsepower -- an increase of nearly 30 percent from the previous engine -- and 245 pound-feet of torque. It is mated to the same smooth shifting, 6-speed automatic transmission as the new Ford Edge. Importantly to customers, even with more power and performance, the 2008 Taurus delivers nearly a 10-percent fuel economy improvement than the outgoing Five Hundred and an increase of approximately 2 mpg on the highway -- thanks to advancements in powertrain technology. Taurus is available in SEL and Limited trims, and is built at Ford’s Chicago Assembly Plant. Research routinely demonstrates that safety features are at the top of customers’ shopping lists. For example, nearly 70 percent of shoppers are interested in side air bags and 65 percent are interested in electronic stability control. With standard air bags and available electronic stability control, the 2008 Ford Taurus is rated the safest full-size car in North America and is a segment leader in safety, capable of achieving five-star ratings in all four categories for the U.S. government’s crash tests. It also has been named a Top Safety Pick by the Insurance Institute of Highway Safety. Ford’s AdvanceTrac® electronic stability control system can predict the vehicle’s intentions using a sensor to detect and measure oversteer and yaw by monitoring the vehicle’s speed, throttle position and steering wheel angle. When the system senses wheel slip, engine torque is reduced and braking is applied where needed to help keep the car tracking safely on its intended path. Additional standard safety equipment includes dual-stage driver and passenger front air bags, seat-deployed side air bags for driver and front passenger, and Ford's Safety Canopy™ side curtain air bags for both rows. For an added measure of safety, a new steering wheel design recesses the air bag 15 millimeters farther away from the driver. 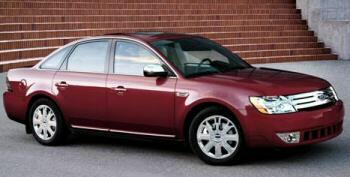 The new look of the 2008 Taurus suggests the same proven emotional appeal of the popular Ford Fusion. The new Taurus features the Ford brand’s signature three-bar chrome grille, a sculpted hood with crisp accent lines and a new front fascia chamfered at the outer edges, adding more structure to the design. New taillamps carry a strong, horizontal theme to the rear, while a new rear fascia houses dual chrome-tipped exhausts. Chrome side vents, door handles and mirror caps give the high-line model a more exclusive appearance. Interior quietness is often associated with a customer’s perception of overall quality. For 2008, the Taurus team has delivered interior quietness that rivals many luxury cars. The new sound package includes such technologies as expandable foam pellets in the A-pillars to reduce wind noise and the use of an advanced sound-deadening material called Sonosorb™ in the doors, headliner and pillars. Sonosorb increases sound-deadening efficiency by 20 percent while retaining the same thickness as the material it replaces. Engineers also reduced road noise by stiffening the area where the rear package shelf meets the floor pan. Even the new climate control system is 50 percent quieter than before. Taurus’ plush, confident ride is further improved for 2008. Upgrades include revised strut towers that help increase front suspension travel by 10 percent, new dampers and springs in both front and rear, and a revised, retuned rear suspension. One of the most significant changes is how the engine is mounted in the vehicle. The engine was previously mounted to the front subframe. On the 2008 Taurus, the engine and transmission are bolted to the body with hydraulic mounts to reduce vibration. By moving the roughly 600-pound power pack off the subframe, engineers were able to better tune the suspension and, ultimately, create an even better ride. A large majority of customers shopping in the large car segment identify front seat roominess as a key want (86 percent) while many also prioritize cargo capacity (63 percent). Answering these desires, the 2008 Taurus features the most spacious interior of any large sedan, with best-in-class legroom front and rear and 60/40-split fold-flat second-row seats. With the fold-flat front-passenger seat, items up to nine feet long can fit inside. Taurus also offers a number of must-have technologies. In addition to a standard auxiliary audio input jack, available convenience features include a voice-activated navigation system, a DVD entertainment system and factory-installed SIRIUS® Satellite Radio. Ford SyncTM also will be available on the new 2008 Ford Taurus this fall. Sync is a voice-activated hands-free in-car communications and entertainment system which fully integrates mobile phones and media players into the vehicle using Bluetooth technology and USB connection. Developed in collaboration with Microsoft, Sync will be offered exclusively on 12 Ford, Lincoln and Mercury products in North America beginning this year. Standard features include: 4-wheel anti-lock brakes (ABS); 3.5-liter V-6 engine; Traction control; Chrome exhaust tips; Fog lamps; Keypad/autolock; Mini spare tire; Power side mirrors; Power windows, locks, mirrors; Remote keyless entry; three 12V power points; Battery saver; Coat hooks; eight cupholders; Air conditioning; Fold-flat seat backs; One touch up/down driver window; Carpeted floor mats; Locking glove box; Heated backlight; MP3 audio jack; Power steering; Leather wrapped shift knob and steering wheel; Manual tilt steering wheel; Remote trunk release; LATCH; Personal Safety System; SecuriLock® Passive anti-theft system; Tire Pressure Monitoring System. Available options include: All-wheel drive; Heated front seats; Leather seats and trim; 18-inch chrome wheels; Adjustable pedals; AdvanceTrac®; Family entertainment system; Ford Sync; Power moonroof; Navigation system; Reverse Sensing System; Daytime running lamps; Triptunes; Power Code remote start system; memory adjustable pedals; in-dash six-disc CD audio system; Electronic Automatic Temperature Control (EATC); eight-way power driver’s seat; Universal garage door opener; Cargo net; Heated exterior mirrors.